County Incomes- feeling the recovery? County incomes and regional GDP statistics for 2013 have recently been released. 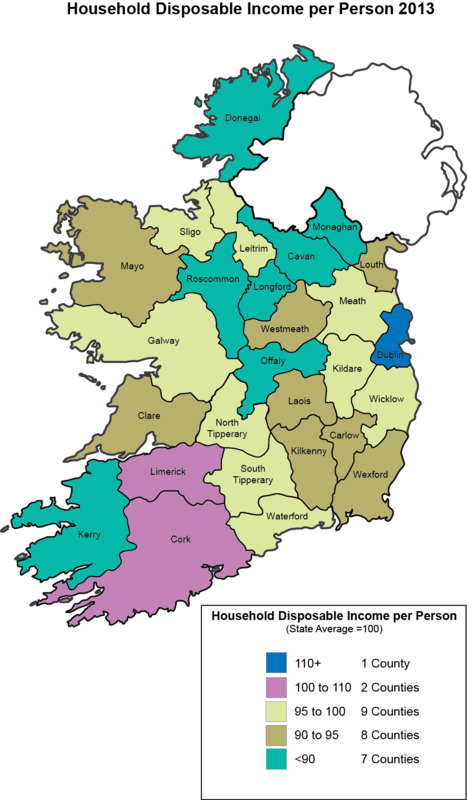 The map below provides a good picture of the situation in each county in Ireland, and the variation in income in the Western Region: Galway Sligo and Leitrim have the highest disposableincomes per person, Mayo and Clare are in the next category and Roscommon and Donegal are least well off. Interestingly this year, preliminary estimates for 2014 were included which is very welcome, providing an insight into more recent income trends. 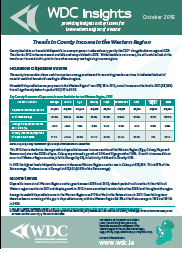 Last year the WDC carried out detailed analysis (PDF 1.5MB) of both county income and regional GDP trends over time . This year shorter reviews will be provided in blog posts and through WDC insights (short analysis of key issues for the Western region) as were published last year . In this post trends in county income will be considered, with analysis of GDP changes and examination of trends in the composition of both incomes and GDP in following posts. Here income at county level is considered, with a focus on disposable income per head. Disposable income includes both primary income and social benefits and other transfers less taxes and social contributions. As such it indicates the level of material wealth of households residing in different regions and is a better indicator of material well-being of citizens than GDP per person. It should be noted that although county figures are available they involve uncertainty and the CSO suggests that the county estimates should be interpreted with caution because the underlying data are not always sufficiently robust and should be regarded as indicative of relative levels rather than as accurate absolute figures, nonetheless they provide a useful indication of the variation at county level. In order to estimate disposable Income per person for the Western Region (the seven counties under the WDC remit), an inferred population estimate was calculated, based on those used for each county by the CSO in this release. A summary table of the key county income statistics is provided below. Source: CSO County Incomes and regional GDP, 2013. † 2014 figures are preliminary. Looking first at the 2013 figures and comparing them to the 2012 figures there are some very striking statistics (it should also be noted that the statistics for 2012 have been revised in this release so previous measurements of income in 2012 in these counties were overestimated). While economic recovery was beginning in parts of the region in 2012 disposable incomes were falling and they fell in most counties in the state between 2012 and 2013. In the Western Region the largest fall (3.5%) was in Donegal and the smallest was in Clare (see Table 1 above). The reasons for these decreases in disposable income will be discussed in more detail in another post as the variation in the trends in the income components in each county are important, but in the Western Region in most counties (except Leitrim) primary income grew while social transfers fell. There was an increase in taxes in all counties in the Western Region (except Leitrim where there was no change) and this, along with small estimated population increases, meant that disposable Income per person fell. Clearly, therefore, this fall in disposable incomes between 2012 and 2013 explains why people were ‘not feeling the recovery’. Even as the economy was beginning to grow again, people had less money to spend. The household disposable income per person in the Western Region was €17,260 in 2013, a decrease on the level in 2012 (€17,512) and is still significantly below its peak of €21,167 in 2008. 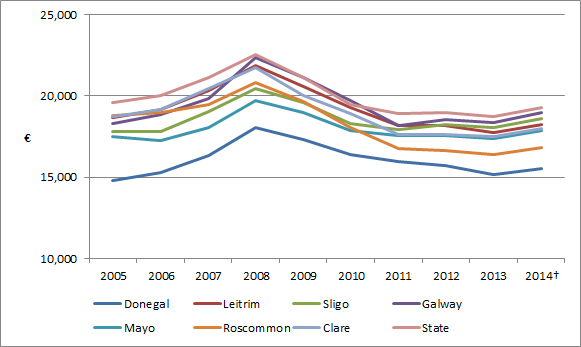 In 2013 the highest level of disposable income in the seven Western Region counties was in Galway at €18,390 (Figure 1). This is 98.3% of the state average. The lowest was in Donegal at €15,178 (81.1% of the state average). Disposable Income per person for the state was €18,707 per person. (See Figure 1 below). Preliminary estimates for 2014 were provided in this release. These should be treated with caution as they are likely to be subject to revision before full release next year. Nonetheless they do show an increase in disposable income per person in all of the Western Region counties and that, despite the fall in income between 2012 and 2013 in all Western Region counties and in the state, and the recovery in incomes estimated for 2014 was in most case enough to bring incomes above those in 2012. Donegal was the only Western Region county where disposable income per person in 2014 remained lower than that in 2012. Galway showed the largest increase in income (2.42%) between 2012 and2014 but incomes in Sligo and Mayo also increased by more than 2% which was a higher increase than that in the state as a whole (1.8%). It should also be noted that, as found elsewhere incomes in 2014 are still below pre crisis levels (in 2008). In Roscommon incomes are 19% below 2008 levels and 17% lower in Leitrim and Clare. 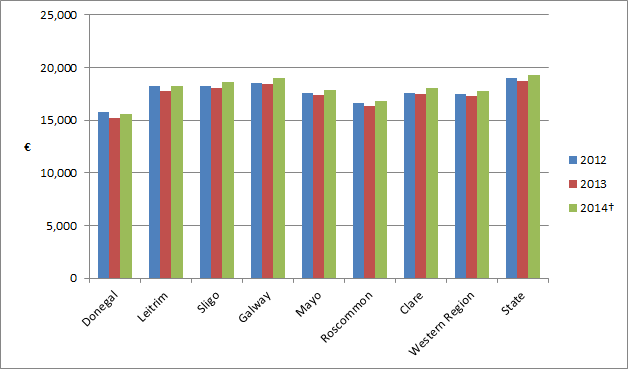 Only Mayo and Sligo (both 9% lower) did better than in the state (which disposable income per person was 14% less in 2014 than 2008. This is illustrated clearly in Figure 2 above, where the 2008 peak in disposable income is very evident. Changes over a longer period are shown below, looking at the pre 2008 growth period, the 2008-2011 period of recession and finally at the beginnings for growth between 2011 and 2014. The huge variation in disposable income per head over this period is very evident. Figure 3 below shows the changes pre crisis, during the crisis and in the early recovery period. Disposable income in all Western Region counties grew considerably between 2005 and 2008, and then fell significantly in all Western Region counties to 2011. Between 2011 and 2014 there was again some growth in disposable incomes in some counties of the Western Region (in particular Sligo and Mayo) but in that period incomes in Donegal fell and in Leitrim and Roscommon were static. The gap between the average household disposable income in the Western Region and the state in 2013 remained the same as for 2012 at 92.3% and in 2014 it was slightly less at an estimated 92.02% of that in the state. Over the long term there has been a narrowing of the gap in disposable income with the Western Region 89.1% of the state in 2000 and 84.3% in 1995. Looking at the variation in income relative to that in the state over time, Figure 4 shows this in index form (Figure 4). Disposable income in most of the Western Region counties has been rising relative to that in the state, with some variation over time (Figure 4 shows how each county has done relative to the state between 2005 and 2012, State=100 which is shown as the pink line). In general the gap between the Western Region counties and the state was narrowest in 2010 the result of a sharper drop in incomes in the more wealthy counties than in most of the Western Region. Since then however, counties have had mixed fortunes. Roscommon had a significantly lower income relative to the state in 2014 (87.2) compared to 2005 (95.8). Clare has also fallen relative to the state starting at 95.5 in 2005 and at 93.3 in 2014 but Sligo, Galway, Mayo and Donegal have improved their position relative to the state since 2005, albeit with some variation. Galway has been the best performer in the region moving from an index of 93.3 in 2005 to a peak in 2010 when its index was above 100.0, though there has been some decline and recovery since (98.3 in 2014) it is still the closest county in the region to the state average. 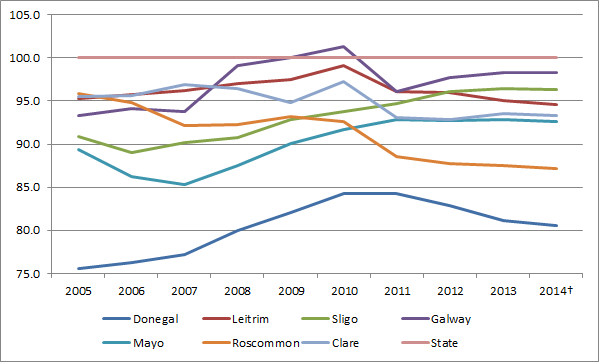 Sligo has also performed well with its index improving almost every year since 2005 (90.8 to 96.3 in 2012). This is its highest index level in this last ten years. The index for Mayo was at a low in 2007 of 85.1 relative to the disposable income in the state. Since then, however, has increased to 92.6. Leitrim also improved steadily in the early part of this period (from 95.2 in 2005 in 2003 to 98.2 in 2010 with a decline to 94.6 in 2014). During this period it has moved closer to the state disposable income than Clare or Roscommon which are poorer relative to the state figure. While further detail on the components of disposable income in the Western region will be discussed in the next blog post, the declines in incomes in all counties, while the national and regional economies (except the South West ) grew) highlights the reason that people ‘did not feel the recovery’. The estimates for 2014 show some improvement in incomes and it will be useful to examine the relative roles of primary income (and its components), social transfers and taxes in affecting people’s disposable incomes. Growth in the economy is very welcome but unless it is experienced as an increase in disposable income by the people living in the Western Region and elsewhere its benefits are not very apparent. 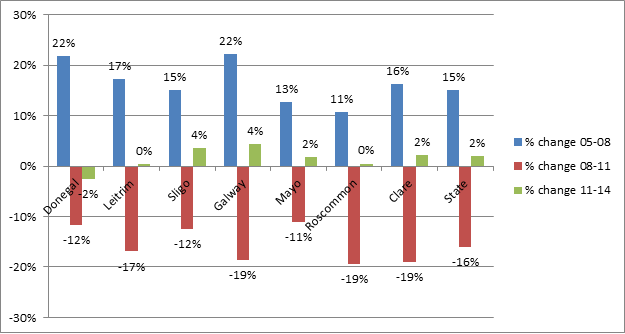 The exceptions were Monaghan, Laois, Offaly and South Tipperary which all had small increases. This entry was posted in Economic Sectors, Economy, Regional Development, Regional Statistics, Uncategorized. Bookmark the permalink.